The good news? Chicago recently announced a mandatory return of recess to all public schools. The bad news? Not all these schools have playgrounds. A front page story recently ran in The Chicago Tribune detailing the significant challenges that schools are facing when it comes to reintroducing recess to children. But luckily, solutions are at hand. Kids can play just about anywhere -- they don’t necessarily need a massive playground or wide open space. 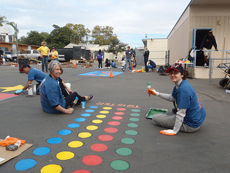 Stretches of plain asphalt at your school present valuable opportunities for play—just add paint! If space is tight, consider petitioning the city to close a nearby street for play at a regularly scheduled time. Transform any space into a playspace with the addition of loose parts, which allow children to constantly reconfigure their environment and to design their own course of play. Recess doesn't have to be confined to the schoolyard. A few 10-minute physical activity breaks throughout the day can work wonders for reducing squirminess and increasing concentration. A recess mentor can help restore healthy, inclusive play to schoolyards of all sizes by teaching kids those "old-fashioned" games that many kids these days don't know how to play. Of course, we ultimately believe that every school should have a playground. KaBOOM! and Dr Pepper Snapple Group are awarding Let’s Play grants ranging from $750 to more than $20,000. For those who think that building a new playground might be too much work, take a lesson from our friends in Playful City USA community Shirley, Mass., who just built a new playground at Lura White Elementary School using a Let’s Play grant! Does your child's school have recess? Does it have a playground? How does your child play at school?